This was what Shaun Stewart and myself discussed late last year and we decided to give it a whack. This would be no easy task and we knew that we would both need to be physically and mentally ready for the task. 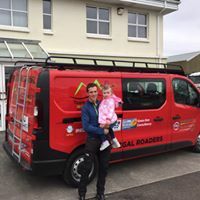 A good team was the key and we were lucky enough to team up with Team Donegal Oil and the Ice Road Trekkers from Donegal. These guys along with some friends would be our backbone as we took on the mammoth challenge. We would ascend and descend over 10,000 metres, run up to 160km and drive over 1800km to reach the finish line on the top of Mount Errigal. Image caption: The van with Shaun and his niece Cara Murphy. Thanks to Manor Motors Donegal. The route would take us from Mweelrea in Mayo to Errigal in Donegal. The previous fastest time was 87 hours and 50 minutes. Our goal and motivation was to beat this time. We set ourselves a schedule that would see us at Errigal in around 60 hours. With an aim like this we would remain focused. We were using Kieron Gribbon’s High Peaks book as a guide throughout. This along with our own maps, GPS and, most importantly, the ViewRanger app would be our navigational aids. This motivation along with the fact that we had chosen two charities gave us a clear goal. My charity was Lakeview School in Galway that provides play therapy to children and is a local charity. Shaun chose Our Lady’s Children’s Hospital, Crumlin, as his niece will be having surgery there in the coming years. The response to the event and the donations from everyone have been amazing. 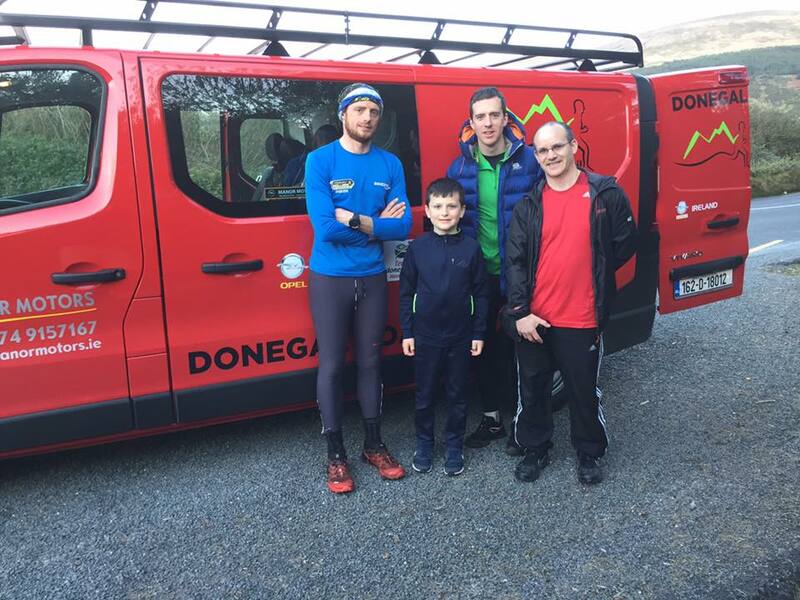 On Thursday the 20th at 6am the van along with myself, Shaun and crew 1, Arthur Mcmahon and Shaun Doherty, left Louisburgh for our first peak in Mayo. Mweelrea is the highest peak in Connaught and a cracking climb overlooking the Atlantic and Killary Fjord. Our clock would start from the summit of Mweelrea at 8am and finish on the summit of Errigal, whenever that may be. Logistically things were now sorted and it was up to us and our crew to knock it into shape. Let the games begin! Image caption: Mweelrea Summit, ready for off! Leaving the dropoff point at Dadreen on the Atlantic side of Mweelrea at 6.30am, we steadily hiked to the summit in just over an hour. Here we would wait until the clock started. The plan was to run down and meet our lift to the opposite side of Killary Fjord for 8.30am. The clock started and we were off, not at full tilt but we weren’t about to hang around either. The descent down to Killary was fast, steep and technical. Shaun was on the phone to Shane Young from Killary Adventure Centre and got the good word that the RIB was on the way and we would be picked up on the shoreline on arrival. I must say it was the most exciting start to a long event we could of asked for. We flew from the base of Mweelrea to the pier at Killary Adventure Centre in five minutes, ran up to the van and were on the way to Ben Baun in seconds. So far so good. Video caption: Shane Young ripping up the Killary. No doubt we will see Shane again soon as he runs the Gaelforce events every year. After a brief journey from Killary we arrived at the start point for the epic Ben Baun climb. There was lots of local support with my family meeting us at the base and all of them spent some time on the mountain, including some of them summitting on the day. We lept out of the van and hit for the trail. A long winding gravel road along by the upper stretches of the Kylemore River. The trail then crossed the river and we followed it to a little isolated house. From here we began the steep climb to the summit. We summitted in 52 minutes and were in really good time. We began to run down the way we came when suddenly a heavy cloud descended. We knew we had to take a left down a grassy valley to take the easiest route back and be able to run this section also. We found this and began to descend. We didn’t realise until a few minutes later at the base that we had made a massive mistake. Mistake number one was not checking our bearing on the map and GPS and mistake number two was being too eager, too early on in the challenge. A lesson learnt now but we both found out the hard way how a simple lack in judgement can cost so much. At the base we realised we were on the wrong side of the valley. We began to run around the base but ran into two more of the Bens. The only way back was up and over. We climbed the next easiest gap between two mountains and would then have a 6-7 km run back along the valley to reach the point where we originally started our ascent. Looking back on this now, it was really only a minor mistake and probably cost us 30 minutes but we would make this up at every opportunity. Image caption: Finally down off Ben Baun. The run back along the valley was actually eventful. Long stretches of bog, hopping over drains and over heather. At one point Shaun was in radio contact with the team when suddenly a baby ram attacked. The ram pucked Shaun in the leg, ran past, turned and came back for another go. Shaun dodged this one, in almost more shock than the poor little ram. On the ram’s third attempt I swung my hiking pole and caught him straight on the nose. He fled across the bog, screeching as he went. On we went having a good laugh. It is funny the things that lift spirits when things have gone downhill as they had at this point. We reached the van and were still only a few minutes off schedule. The lads spirits were high and this kept our heads up. The crew decided on throwing the Laois/Offaly county high points in now rather than tracking back across the country later in the trip. We pulled up beside a boggy hill. Less than 20 minutes later we were back at the van after a quick run up the wet bog. The county high points were only metres apart. A quick snap and off we went, Co. Clare and the gorgeous Moylussa, overlooking Lough Derg awaited. We arrived at Moylussa at 3.30pm and started the 10km run. Paul Tierney, a fellow ultra runner joined us en route. Thanks so much to Paul as he is currently carrying an injury. As always, it is amazing to have a local on the mountain. The route took us up some nice forest roads, along forest trails. A winding steep section near the end before a boardwalk took some effort but we were soon on the top in search of one of the two high points. A quick photo in the bog and we started off downhill. We ran back to the van fast and completed the route in just over an hour. Image caption: Top of Moylussa, Thanks to Paul Tierney. Everyone has heard of this one, the highest peak on the island. We were steeped by the perfect conditions as we set off and even more delighted to see two friendly faces in Chris Caulfield and Linda O Connor. Both Chris and Linda have heaps of experience on Carrauntoohil; Linda having summitted twice last weekend in one day, just for the craic! What an amazing hike. I was feeling a little woozy in the van with a bit of car sickness hanging around so couldn’t wait to be on a mountain again. We were eating on the go, fuelling on dehydrated food in hot water and trying to take on some fruit and calories before each climb. This sounds easy, but eating gets difficult when the body gets tired. There was not much time hanging around at the car and with good instruction from Chris we set off ahead before he caught us on the mountain bike. Linda soon caught us near the Devils ladder section. The hike consists of a few kilometres on the road before a tricky rocky and muddy section along a stream. From here you see the valley rising on all sides and the spectacular Carrauntoohil to the North East. The Devil’s ladder is a very steep section of boulder leading up to the final ascent at the bottom of the main cone of the mountain. We made good time on the ladder and were soon on the final ascent. This was a lung busting ascent but well worth it. No doubt the best view of the entire trip. You can check out the videos from our climbs here. We were the highest people in Ireland for a few minutes. The climb took us 1 hour and 15 minutes to the top and we would descend in about 45 minutes. The descent was reasonably quick apart from being extra careful on the ladder. An option to take the zig zag path was discussed but we reckoned saving the running legs for later was the smart move. At this point I was feeling reasonably good although the first few mountains had shot my quads. I actually think my quads never fully recovered from The Race a few weeks before this event. They would remain sore but not get a huge amount worse than this on the first day. We arrived back to the team at 9.30pm, just as it got dark. Perfect timing and all going to plan. We were ahead of schedule. Linda stayed as our guide for her local Knockboy Mountain. We took a quick break for a takeaway in Kenmare before heading to the mountain. The twisty roads were starting to take their toll on my system and I could only hope this would pass. Linda was a great guide. It was late and the visibility was poor in Knockboy. Linda left lights at points along the trek to be sure on the descent. The trek was heavy and boggy but we were up in no time and ran the majority of the route back to the car. A gunshot sounded on our descent and a quick work from the lads over the two way radios alerted us to some lamping going on on the bog. I later saw a car with some guys heading down the valley. They were lamping out the window and shooting at anything that moved. They could have had some mountain runners for dinner… I hopped into the car with Linda as far as Cork, which gave me a little rest and settled the stomach. I didn’t sleep much, which I really would have needed at this a stage. Galtymore was next at 2am and a long trek ahead. 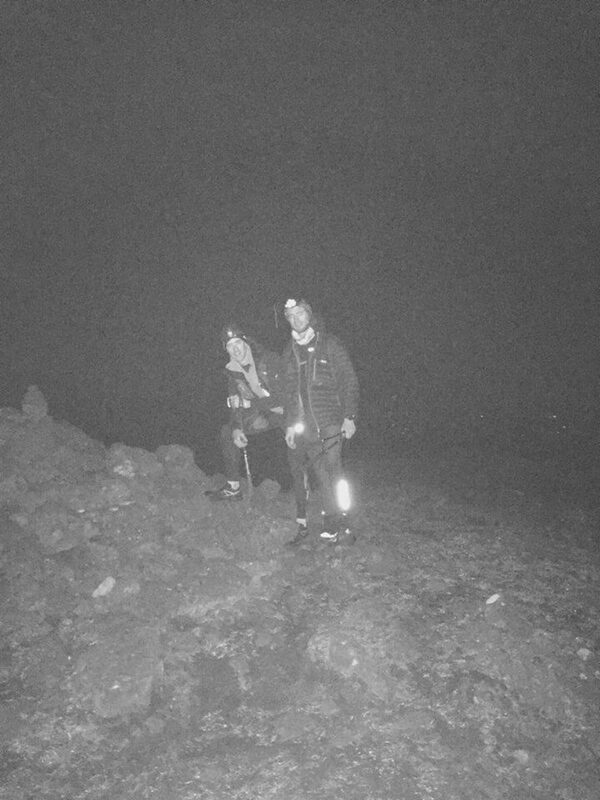 Image caption: Galtymore in the dark. A top runner Adrian Hennessy joined us as a guide on Galtymore. Adrian said he was up the mountain hundreds of times. He had been watching our tracker all night and was waiting on the roadside to guide us to the start point and then join us for the hike. Top class guy. We left at 2.26am and arrived back to the van at 4.35am. Not a bad trek for the middle of the first night. We were starting to feel the cold a bit but the food from earlier seemed to be working. The trek here was 11km, some of which was over gravel road. It then turned into bog and heather before becoming a lot steeper toward the top. A 15 minute buster of a pull near the end saw us on top and the cairn was easily found. It was only months since I was here during the day but at night mountains are a different and far more dangerous world. A hop and a skip and off we went back down the mountain. It was good to think we only had one more hike before our first night was over. Another milestone, always needed. We arrived at Knockmealdown at 5.14am. It was still dark but the light would soon arrive in the sky. The weather was still very settled. From the car we were instantly climbing a steep rocky path which seemed to go on and on until the top of our first peak. The county high point was two more peaks away with some nice descending and ascending in between. It was a little demoralising to see that we were taking the longer route around to the peak. However, we decided the steep route up the side of Knockmealdown itself would not of been worth it. The sun rose and the colours across the valleys below were spectacular. I never realised Waterford was this beautiful. The bogs in April are at their best with all sorts of browns and greens as well as the gorse in full bloom. We took a quicker, much steeper and direct route down the mountain and called the team to let them know the point on the road we would hit. A total of an hour and a half on this county high point was a bit more than expected but another ticked off. A famous young man arrived as we were about to take off. Dillon Lynch, the youngest person to climb the 26 peaks in 14 months had been following us. Himself and his dad joined us for a photo and donated some money to the charity. Image caption: Dillon Lynch and his dad, legends. The next three counties high points were at Brandon Hill and Mount Leinster. Generally featureless mountains. The high point at Mount Leinster is home to an RTÉ mast while Brandon Hill in Kilkenny was boggy but we were up and down in 30 minutes. The aim was to get through these few quickly before the longer Lugnaquillia trek began. Image caption: Brandon hill Killkenny. We pulled up at Lugnaquillia to meet two endurance athletes, looking all fresh and smiley. Paul Mahon, a well known endurance racer and adventure athlete was one of our guides. Paul set up the Quest Adventure racing series and is involved in everything adventure racing. He has vast experience both at home and abroad. Our second support runner was Alan Kearney, a man I have met at numerous races and is always one for a motivational word, just the man needed at this point. Lug (short for Lugnaquillia) was a long trek but with the lads the time flew. Paul was throwing bagels and sandwiches at me and kept saying “eat, drink, sleep”. The food was very welcome and I managed to eat it, even though the last few hours in the van hadn’t helped my van sickness. The hike up towards Lug summit was a slow drag, nothing too steep but a constant gradient. It is real trail running countryside and there were plenty of hikers out and about. Image caption: Lug crew and me with a mouthful of bagel! As you can see the top was covered in cloud so we didn’t take in many Wicklow views from here. We started our descent and were able to run the majority of the route back. It was great downhill running terrain but I couldn’t fully let go as we had a long way to go yet. We reached the van at 1.30pm, two hours up and down. Not bad for a 14km. The next 5 peaks Cupidstown, Kildare, Kippure, Dublin, Carnbane East, Meath Mullaghmeen, Westmeath, Cornhill and Longford were reasonably boring to be honest. Absolutely nothing against the counties but they are not known for their mountains. Boggy runs along with some trail and forest park runs summed up these high points. If ever in Westmeath, Mullaghmeen forest is a lovely spot for a walk. There are some pretty nice views from the high point of the surrounding countryside. Longford was a classic tourist site. It was used in Glenroe and other programmes in the past. A mast is located at the top. The Dublin and Kildare sites are more TV masts and hikes along the road led to the peaks. Carnbane East was probably the coolest site of the lot. A quick sprint up a nicely cut grass hill to a tomb site and huge mound of rocks at the top. A woman was there looking at the tomb and was startled to see two guys run up, take a selfie and run away as quick again. We changed over to crew 2 at Kippure. Denis Ferry and Leslie O Donnell took over and boy were the Ice Road Trekker boys keen. It was like a new lease of life in the van. Thanks so much to Arthur and Shaun who deserved some rest at this stage. We said our goodbyes and the boys just told us to keep her lit. Denis and Les have vast experience in Ireland and abroad. They have driven in The Andes on the world’s most dangerous road, have circumnavigated Iceland – just to name only a few of their amazing feats. Check out the link to an adventure in Alaska here. Image caption: Cupidstown, Kildare. Running and eating icecreams! Image caption: Carnbane East, looking a bit sleepy! Image caption: Mullaghmeen, awake after a nice forest run. It was Friday evening when we arrived at Seltanasaggart on the Roscommon/Leitrim border. A 6 km run was ahead of us but it was mostly on gravel road. The county high points for both Leitrim and Roscommon were hidden in a huge windpark. The turbines actually made things a bit more confusing and it took us some time to find our bearings at the top. Thanks to some good teamwork we eventually found the two piles of small rocks nicely hidden in the heather at both sites. We lost some time but didn’t put any extra distance on the legs, which is vital at this stage. The grounds around the turbines were full of rabbits and hares, definitely looking a lot more spritely on the feet than us at this stage. The second night closed in as we came down off Seltanasaggart and I was about to enter a world of pain. On arrival at the Sligo high point starting point we were informed by Kieron Gribbon that we needed to find the Co. Leitrim high point here also. This was going to be a bit tricky as it was dark and very misty; visibility was extremely low. The motion sickness was really starting to flatten me and it was going to be a long night. I felt fine when out and about but within seconds of sitting in van I was buckled. I couldn’t eat, therefore I found it hard to sleep and, if I would vomit, it wouldn’t be long until dehydration set in. I managed to keep sipping water. 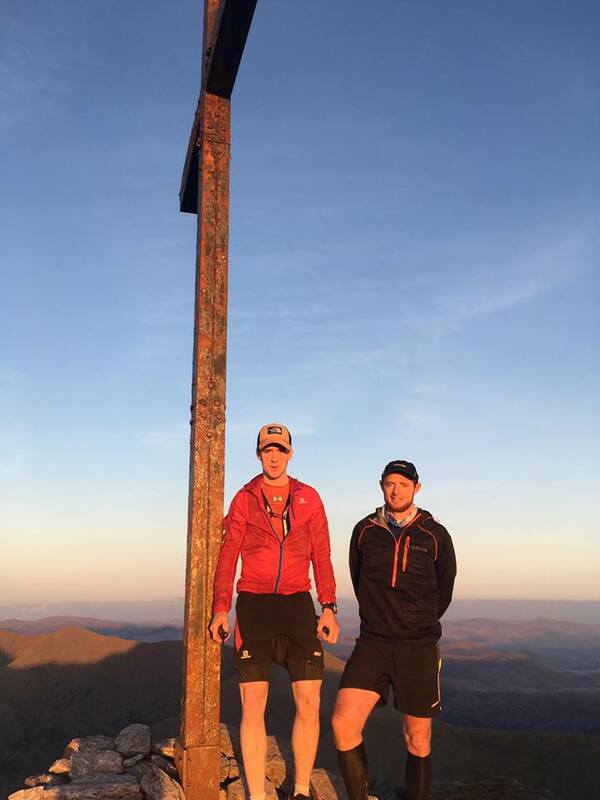 A good adventure racing buddy of ours, Aidan Mc Moreland, met us for the Sligo peak and with his local knowledge and a bit of compass work in the dark we found both peaks after a bit of a soaking. Image caption: Sligo with Aidan. A new boardwalk has been built here after a stretch of about 2-3km on the road. This would lead us all the way to the plateau on top at Cuilcagh. The top was then a mud-bath for over a kilometre before reaching the county high point. Shaun was clever on the top and laid out spare headlights on strobe mode so we wouldn’t go wrong on the descent. I had vomited on the journey to Cuilcagh and had only managed water in the last few hours. Things were grim but my legs were still working. I knew I needed sleep soon to kill the sickness. The boardwalk was welcome underfoot after so many boggy hikes. As the boardwalk went on it got steeper and there were huge sections of steps. A pretty impressive piece of engineering it must be said. After finding the cairn on top we ran back on the boardwalk. A pretty fast descent after a long slog up the way. I found my map which I dropped on the way up as we descended. I’m deadly for dropping things! I have a feeling Shaun would rather I leave this one out. A long, long, LONG hike up across a bog, to a tiny little hump on the far side. The light arrived along the way and I managed to eat a bit of a bar and drink some water. The grouse were startled as we made our way through the thick heather. It was real hunting countryside so the bog actually suited me a bit. This definitely felt like one of the longest and most energy zapping runs of the entire trip. It was never ending. We managed to run little bits on the way back. The van, which I had come to hate at this stage, was actually a welcome sight. On arrival at Slieve Gullion I was at a major low. The team decided that I needed sleep to overcome the sickness. I slept in the back of the van for 30 minutes. I woke up not having a clue where I was. Shaun’s dad, Patsy, and brother-in-law, Ronan, arrived at this point and someone handed me a ham sandwich. I sipped water and ate the sandwich as we climbed Gullion. Gullion was a gorgeous climb with real mountain trail all the way up. It was steep but well marked out. We found this in Northern Ireland. There seemed to be more maintenance and more marking on the mountains. The facilities were definitely top class. I ate almost all the sandwich and we summitted in no time at all. We were up and down in 40 minutes and left Gullion at 8.46am. I hopped in the car with Patsy and this was my saviour. I was instantly well and Ronan made me another ham sandwich using a plastic spoon in the back seat. I was on the way back. Now all I needed was a little sleep. I slept for 20 minutes before we reached Slieve Foye. The roads in the North were smoother and the chance to stretch out in the car seat was amazing. Image caption: Top of Gullion, after my first sleep. Only 48 hours into the event. Slieve Foye rises from the sea at Carlingford. I think this was the one county in Ireland I had never set foot in and I have to say it was high up on the list for beauty. The climb went straight from the village up across some sheep grazing land and was steep all the way to the top. The views were spectacular and I was finally feeling good again. My heals were sore and my quads were hating the downhill but my spirits were up, which is key. We finished the mighty Foye in 1 hour and 10 minutes. A really good effort at this point in time. An hour’s journey lay ahead and I needed sleep. I ate first of all and then slept for 40 minutes. Absolute bliss! This would be our last big boy before Errigal. I was asleep until we pulled into the carpark at the base of Donard. Donard is famous and people come from far and wide to climb here. It is mostly famous for being one of the few big mountains where your climb starts at sea level and finishes at 850metres. The course record is 53 minutes up and down, not one we were looking to beat!! A local mountain goat, Declan Magee, joined us in the car park. I was literally hopping out of the car when Declan and Shaun took off running. I had been asleep so had little idea what was happening. Denis got a fit of energy and started running with me across the car park and across the next field until I started to catch the lads. Denis patted me on the back and wished me good luck. I said I’m gonna need it to catch these two lads. I soon did catch up as the lads slowed a bit. After my first real sleep the body had shut down a bit. The Donard hike up was really tough and I had dizzy spells but kept moving throughout. The mountain was packed with hikers and passing people out along the way felt good considering what we had behind us. It was long and steep as we made our way from a forested area into the open and up along a rocky climb before turning left and facing “The Wall”! The wall was a few hundred metres of high gradient slog. People were really struggling here but we made our way up nice and steadily. A quick photo and a bite of a protein bar and we were away again. Declan knew all the locals so was stopping every few minutes. Once on the slightly less steep ground I found a wind and really enjoyed the fast running descent from here all the way back. We were up and down in less than 2 hours and felt like we were moving and on the home stretch. The plan was to really go for the next few peaks and try make up some time. Everything was still on target at this stage. Truskan and Sawell were real bog slogs but we pushed through them as hard as we could. Truskan was more gradual with Sawell the Derry and Tyrone high point was a decent climb. The views of the rolling Derry hills were really nice and the home straight was in sight. The team gave us a massive cheer as we came down off Sawell, knowing that we were nearly there. We were flying on the downhills again, especially the boggy ones. The one we all waited for! It was an amazing feeling to arrive at Mount Errigal to a huge crowd of supporters and realise we were nearly there. In saying that we were 4 minutes behind time and wanted to keep the clock under 61 hours. We bolted from the van and took off running. Image caption: The tracker after 60 hours. A local man, Andrew Wallace, joined us, having barely managed to change in his car as we arrived. Errigal is reasonably short but steep and technical. It is a nasty mountain when you are tired but we were motivated to keep the time down. We raced to the top in 30 minutes and the clock stopped on the top at 60 hours and 35 minutes, shaving 27 hours and 15minutes off the previous record. The reception at the top was amazing. In the cold breeze and the setting sun we were met with hugs from locals and most importantly for me, Emma, Dee and Greg were there for a massive hug. I was more relieved than emotional to be honest. The emotion had hit me after Slieve Foye when I had gotten over the sickness and knew I was going to finish this challenge. The feeling now was ecstasy. Paul Doherty, a professional photographer, took lots of photos on the top and we took in the views for a while before everyone was too cold to hang around and we knew there was a crowd waiting at the base for our return. We ran down and across the bog at the bottom at full tilt! food, a celebratory beer and a huge crowd of amazing people awaited us. 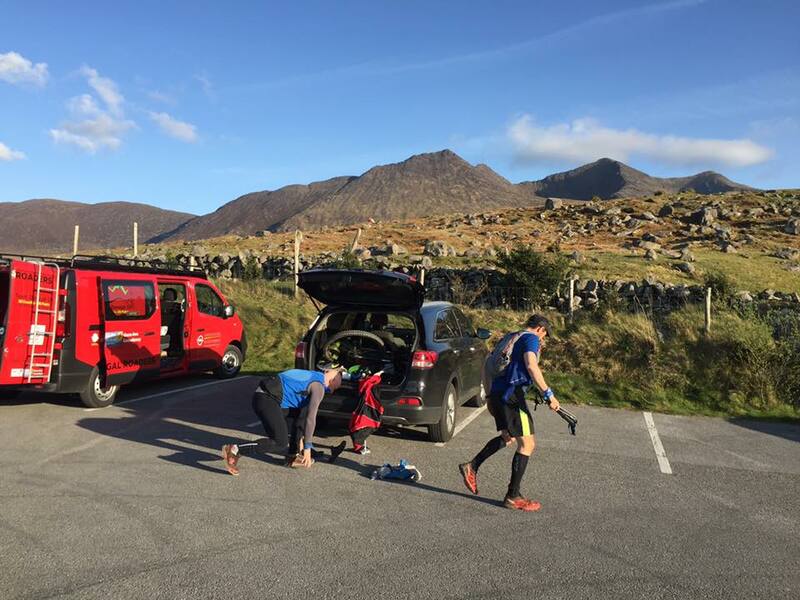 Image caption: A few photos from the summit/finish line on Mount Errigal , Donegal and more at the base. The week since the event has been hectic with a lot of media picking up on the event. We are so thankful to everyone that has been involved and showed an interest and hope that in future more people will give this and other similar challenges a go. Listen here to a few of our interviews! Dermot and Dave interview from 34 minutes on the 26th of April.